The front door of your home speaks volumes about who lives inside. Entry doors must be attractive enough to create a good first impression, yet durable enough to withstand Toronto sun, wind, rain, and potential intruders. An entry door has the power to either add to, or subtract from your home’s safety and curb appeal, making it a significant investment for any homeowner. You have many options for entry doors, including colours, materials, and glass options, and choosing an entry door that matches your home’s style and adds the energy efficiency you desire can be a tricky process. This guide from the experts at Brock Doors and Windows will help you select the entry door that’s best for you. Brock’s Toronto entry doors have Energy Star certification which means they offers valuable benefits such as lowering utility costs and protecting your home from leaks and drafts. Choosing the style for your entry door is an important aspect of replacements. The goal is to complement your home’s design and also enhance curb appeal. Whether you want glass panels that simply offer more light, or something more decorative, Brock offers you plenty of style and glass options from which to choose. The stylish Fusion door collection presents top quality, wrought iron hand-crafted doors, ensuring that no matter your design preferences, your entryway will always create a unique and elegant first impression. Best of all, our Fusion products offer more than simple quality and beauty. All our Fusion products are backed by Fusion’s philosophy, which strives to treat all clients, suppliers and employees with the utmost dignity and respect, so when you choose any of our Fusion products, you know you are in the hands of a company you can trust. Brock’s Fusion doors collection is highly customized to fit your unique tastes, and offers a variety of stylish modern and classic entry door options. With decorative glass in a myriad of artistic patterns, our entry doors are all built with the utmost standards of craftsmanship. Our Fusion brand offers unique and creative decorated glass windows with bevels of all shapes and sizes, and designs including stained glass, vector art, frosted or textured glass. All these beautiful options come with increased safety and easy-to-clean features. Accessories are available in a variety of finishes, including silver, gold, copper and even bronze. Our “Traditional” Fusion series delivers classic and old-world styles, lending an elegant and timeless atmosphere to any home. For the homeowner with the refined modern taste, we recommend our imaginative “Contemporary” door collection. All our Fusion products come with Low-E; Argon-filled glass, and include a full lifetime warranty from the manufacturer against seal failure on all insulated door lites. 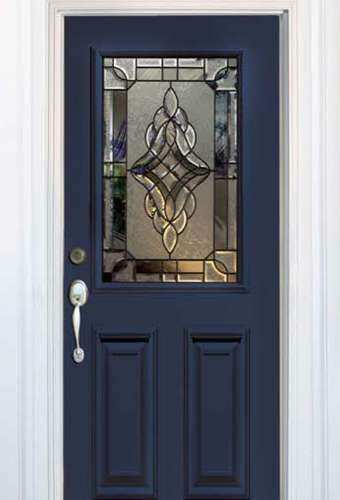 In addition to Fusion Glass Works, Brock carries other superior entry doors from many other manufacturers. No matter which manufacturer you choose, the experts at Brock Doors and Windows provide you with all the options to ensure your new entry door is both tough and beautiful, and we are more than happy to help you make your entry door a work of art.